I decided to bought this unit for myself way back in 2005. I considered it a "gift" for myself since I never had a chance to really bought something for me. Most of the time, I always considered my family's need first (not that I'm complaining). I purchased it at 27k that time...that's the most expensive thing that I bought in my entire life....ahahaha. It's more pricey than my wedding gown but that's ok. The money that I paid for that phone is all worth it! No regrets at all. Nowadays, there are a lot of mobile phones coming out in the market which offers "special features" that other phones don't have (as what they claimed). And there is one phone that for me (I think) outstands the other phones. I'm talking about the W960i. 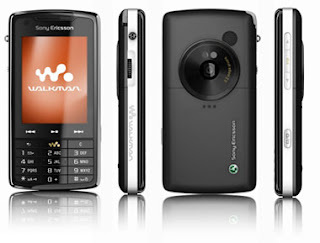 It's the latest (if I'm not mistaken) model of Sony Ericsson Walkman phone. The W800i was the first walkman phone that came out in the market. It offers an 8 GB memory! Whoa! Talk about innovation indeed! Also, it has touch screen feature with a 3.2 Mega Pixel Camera and of course a walkman player and FM radio. I LOVE this phone ALREADY!